Man Rebuilds Historic ‘Tesla Spirit Radio’. When He Turns It On? Terrifying! 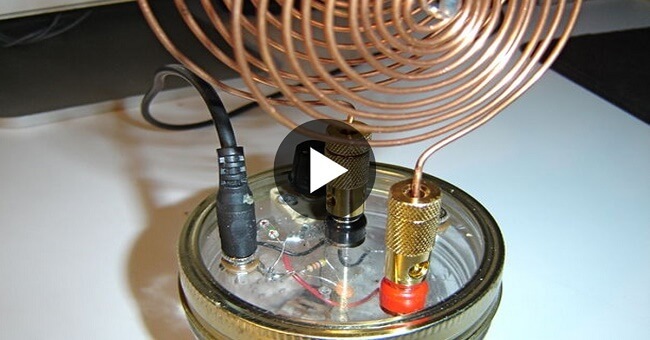 The video you are about to watch shows the Spooky Tesla Spirit Radio, a non-powered crystal radio circuit that is plugged into an iMac computer sound-in port. This simple device can detect lightning, make voice phenomena, interact with all forms of light, create music and sound effects, read a computer screen, act as a mike, detect RF pulses, and more! The radio's antennas are inspired by Tesla's high voltage examples, and its basic LC circuit is similar to Tesla's original inductor and capacitor circuit schematics. The Spooky Tesla Spirit Radio recently won the monthly Gadget Freak award by Design News, the world's best engineering news magazine.